The 17th Annual NMCA Muscle Car Mayhem event kicks off another year of insane NMCA drag racing with everything from Xtreme Pro Mods and Street Outlaws to Nostalgia Super Stockers and Nitrous Pro Streeters and everything in between! 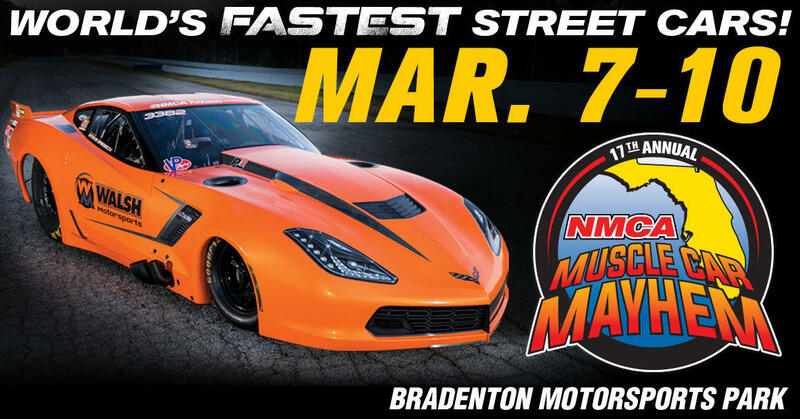 If you love TV's Street Outlaws...then this event's for you as the World's Fastest Street Cars of NMCA invade Bradenton, Florida! Turbo vs. blower vs. nitrous action dominates as 200+ mph Pro Modifieds combine with Detroit Muscle of all generations for wild 275 Radial Racing, Big Tire Outlaws, and more! NMCA Muscle Car Mayhem also features a HUGE Car Show (Saturday & Sunday), a GIANT Manufacturers Midway, and much more as the NMCA Muscle Car Nationals kicks off its 2019 season. The NMCA starts its season the weekend of March 7-10, 2019, at Bradenton Motorsports Park in Bradenton, Florida, with the 17th Annual NMCA Muscle Car Mayhem. The high-horsepower street car Battle Royale is the ultimate excuse to ditch the cold weather and come south to witness NMCAs large line-up of heads-up categories, including Xtreme Pro Mod, Factory Super cars, Street Outlaw, and much more! The championship hunts starts each season in Florida and no one knows that better than the 3,000hp VP Racing Fuels Xtreme Pro Mod category. Teams tighten their blower belts, turn up the boost on their turbochargers, and load up an extra nitrous bottle as they chase the glory at insane speeds.